Midlife can be a time of disorientation and disruption. Sometimes we call it a Midlife Crisis. It is also an Invitation. What we might call a Midlife Crisis is often triggered by a life event. It might be the death of a loved one, or disillusionment with work, or perhaps a divorce. We think of Midlife Crisis as a time of outer changes. At its core, it is an invitation to come home to our true selves. We’ve often been playing by someone else’s rules, and it is time to come home. It’s a Hero’s Journey, and you are the Hero. You were born being a Hero, on the inside, just like the powerful Oak is in the acorn. Your midlife transition is offering you the opportunity to step into your full powers, and to live your life authentically. The Hero’s Journey is a myth that is common across cultures, worldwide. It is a spiritual journey. The hero leaves their known world and ventures out into unknown territory. He/she (gender is irrelevant) encounters monsters and dragons, helpers and wizards, and digs deeply within herself to discover her true powers, in order to deal with the new challenges along the way. As a result, she finds who she really is, and she brings this understanding and wisdom back into her world. Now she creates her life in a way that is most authentic to her. And, she has received gifts from her Hero’s Journey that she will share with her community, making a contribution that is meaningful and purposeful to her. For more info about the Hero’s Journey and midlife transitions, click here. Sounds exactly like what we call a Midlife Crisis, doesn’t it? How do heroes find their way in their midlife journey? Heroes learn to do two things better than the rest of us. They navigate the dark unknown territory of their life transition with their inner compass, rather than the outer compass points of others’ opinions and Shoulds. They faithfully do their inner practices that allow them to feel like they are captains of their own ship, and to move through their life transition with clarity, focus, and power. What are those essential inner practices for your midlife transition? Regain a feeling of control; acknowledge that it’s a spiritual journey and that you are a hero. Manage the stress of your midlife transition. Let go of the non-essentials of your life, inner and outer. Navigate the unknown territory of your midlife transition, using your inner compass. Embody and sustain the authentic power and energy of your True Self. Claim the authority of your own voice and truth. Make your unique contribution to your world, giving you a sense of meaning and purpose. These sound good, but HOW do you do them? 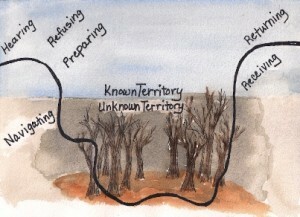 Wayfinding Coach is all about giving you the HOW of these practices, so that you can navigate your unknown territory with clarity, power, and focus. Then your midlife journey, and your life, can both be a powerful adventure. Life Coaching is a powerful process that will help you do all of the above activities more effectively and efficiently than going it alone. Like my Facebook page for tips, tools, and new resources. Get my free Inner Guidance Hotline Kit by filling in the information at the top of the right sidebar on any page on this site. Sign up for my Blog, where I share my own journey (scroll down the right sidebar until you see “Follow the Wayfinding Blog”). Check out the Freebies + Kits page on this website for info and tools on life transitions. Menopause is a physical change that is also the ultimate retrieval of our spiritual selves. If you are in peri-menopause or menopause, check out the Your Menopause Journey section of this site, that’s especially designed to support you.